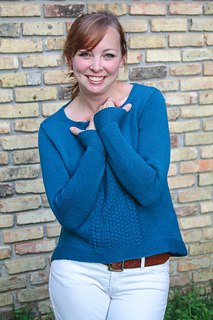 Olmsted is a top-down, totally seamless pullover with a dipped hem, plait cables, and set-in sleeves. 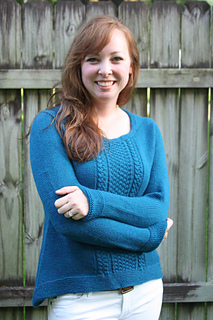 The shoulders, sleeve caps, and hem are shaped with short rows. The body has a bit of an A-line shape for comfort. 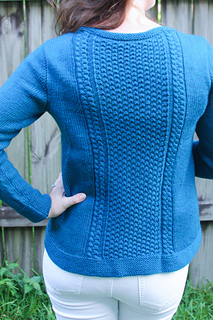 The front and back feature a wide (wider on the back) panel of double seed stitch set off with a cable on each side. 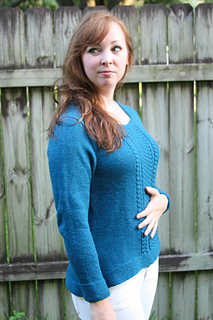 Easy to toss on over a button-down or alone, with jeans or a skirt, Olmsted is basically a fancy sweatshirt. 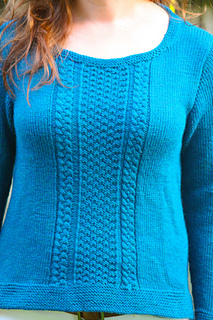 Skills needed: Knitting in the round, working short rows, basic increases and decreases, cables, picking up stitches, provisional and backwards loop cast ons, knitting with double-pointed needles. To be worn with 0-4 inches of positive ease in the bust. Shown in size 36.75 with no ease.